Prince-regent Vijaya, the eldest son born to Sinhabahu and his twin-sister Sinhasivali, was cruel and callous – an embodiment of evil – and likewise were his friends. Angered by the many intolerable deeds of violence executed by the prince-regent and his followers, the subjects of Sinhapura brought the matter before the king. However, the king took no action against the prince-regent. The angry subjects finally asked the king to kill his evil son Vijaya. The exasperated king arrested his eldest son Vijaya, the prince-regent, and seven hundred men who were his followers. After disgracing them by shaving off half the head of each person, he banished them from Lála country by loading the men, their wives, and their children on separate vessels and set them afloat on the sea. 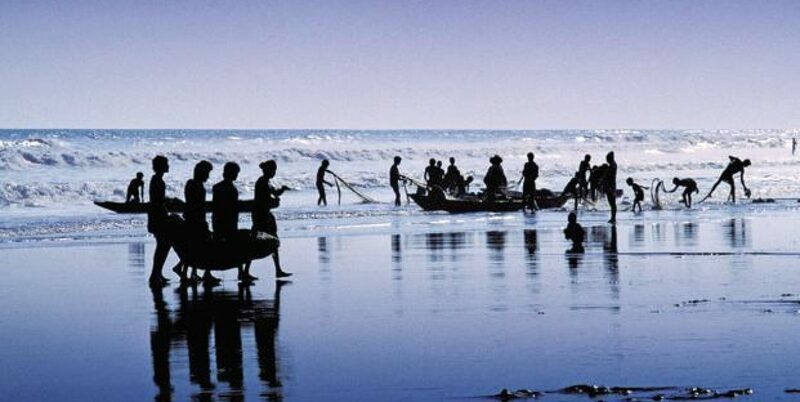 The children landed on an island called Naggadipa or the ‘island of the naked’ (Jaffna Peninsula in Sri Lanka). The women landed on an island called Mahiladipaka or ‘islet of women’ in the Maldivian Islands. Prince Vijaya and his unruly followers landed first at the haven called Suppäraka, now identified with modern Sopara, in Thana district north of Mumbai. However, the hostile reception by the natives, and also dissidence and violence among his men, forced Vijaya to embark again. The second time, their vessel driven by the violence of the wind, they landed on the island of Sri Lanka. Vijaya and his men after disembarking from the ship sat down, wearied, on the ground. They found their hands and bodies coloured by the red dust that lay there. So, they called the place Tambapanni (“copper-colored sand”). Later on, Vijaya founded his capital in Tambapanni, and the island came to bear the same name. The Alexandrian geographer, Claudius Ptolemy (c. 90 AD – c. 168 AD) identified the Island as ‘Taprobana’, derived obviously from Tambapanni, when he drafted his map of Sri Lanka. It carried an elaborately ornamented sketch of a wild elephant and a legend in Latin set inside a decorative frame. The map only had a vague resemblance to the Island’s broad base and tapering tip. The ascetic blessed them by sprinkling on them water from his kamandalu (Tamil: kamandalam). After winding a thread about their hands he disappeared.